If research is a breeze but writing a resume is a bane, check out this sample resume for an experienced research technician to get inspiration. To be a successful candidate for research jobs, resume expert Kim Isaacs says it helps to have a comprehensive resume. If research is a breeze but writing a resume is a bane, review resume samples to learn how to emphasize your most impressive qualifications. 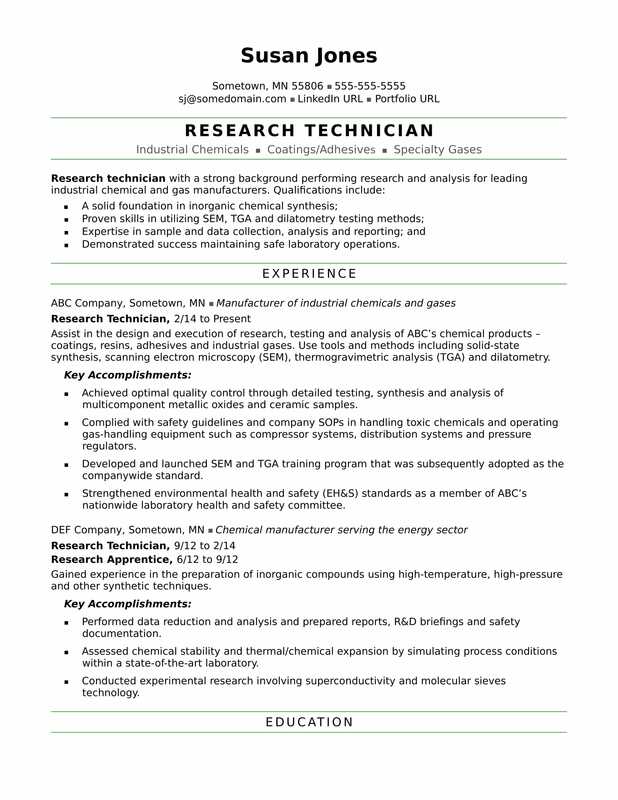 View this sample resume Isaacs created below for a midlevel research technician, or download the research technician resume template in Word. And if you need more help, get a free resume evaluation from the experts at Monster's Resume Writing Service. Additionally, you can learn more about science careers and search for research technician jobs on Monster. Demonstrated success maintaining safe laboratory operations. Assist in the design and execution of research, testing and analysis of ABC’s chemical products – coatings, resins, adhesives and industrial gases. Use tools and methods including solid-state synthesis, scanning electron microscopy (SEM), thermogravimetric analysis (TGA) and dilatometry. Achieved optimal quality control through detailed testing, synthesis and analysis of multicomponent metallic oxides and ceramic samples. Maintained compliance with safety guidelines and company SOPs in handling toxic chemicals and operating gas-handling equipment such as compressor systems, distribution systems and pressure regulators. Developed and launched SEM and TGA training program that was subsequently adopted as the companywide standard. Strengthened environmental health and safety (EH&S) standards as a member of ABC’s nationwide laboratory health and safety committee. Gained experience in the preparation of inorganic compounds using high-temperature, high-pressure and other synthetic techniques. Performed data reduction and analysis and prepared reports, R&D briefings and safety documentation. Assessed chemical stability and thermal/chemical expansion by simulating process conditions within a state-of-the-art laboratory. Conducted experimental research involving superconductivity and molecular sieves technology.